1. How do I convert my Powerpoint presentations to DVD Video ? Please refer this tutorial link. 2. What is the difference between the Standard DVD format and the Video file format ? The standard DVD format convert PowerPoint presentations to DVD video format with menu options, whereas the Video file format convert PowerPoint presentations to various video formats to support portable and third party devices. 3. How to get better Output Quality ? The output quality of conversion primarily depends on the PowerPoint presentation itself, the various effects applied on the presentation and the PC configuration. A good PC with high configuration will result in high and better output quality. Also select the Frame Rate as the highest value to get better output quality. During conversion make sure all other applications are closed and no screen-savers and anti virus software are running behind. 4. Does PowerDVDPoint Pro support Batch Conversion? Yes, PowerDVDPoint Pro supports batch conversion. The program can convert about 15 numbers of PPT files at a time. 5. How many video formats are supported by PowerDVDPoint Pro ? The current version of PowerDVDPoint Pro supports 37 types of video conversions. More are on the way. 6. What all types of narrations are supported by PowerDVDPoint Pro ? PowerDVDPoint Pro supports the normal PowerPoint narrations and narrations with video clips captured using a web camera. 7. After conversion the inserted video files doesn't play ? Check to see if the video clip was playing fine and automatically in Powerpoint before conversion. 8. What version of Microsoft PowerPoint is supported by PowerDVDPoint Pro ? Though PowerDVDPoint Pro is a stand alone application, you need to have Microsoft PowerPoint 2002/2003/2007/2010 to get presentations converted to DVD video format. 9. What is the advantage of PowerDVDPoint Pro converter ? 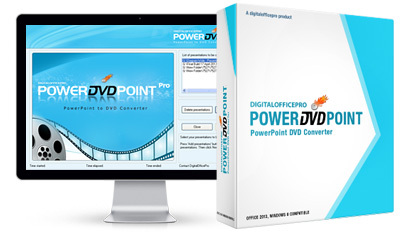 PowerDVDPoint Pro converter allows you to convert PowerPoint presentations to DVD video format. You can easily view your presentation via TV, DVD Player and other Portable devices like iPod, iPhone, Pocket PC, etc. 10. Does the DVD play automatically when inserted into the DVD player ? After conversion, burn these files to DVD/VCD. When you insert these discs on DVD/VCD player it will start playing automatically without any problem. 11. Is it necessary to have PowerPoint installed in order to use PowerDVDPoint Pro converter ? Yes, in order to convert PowerPoint presentations to video, PowerPoint needs to be installed. After you have converted the presentation to a video file, you can watch the video on any computer or other device without use of PowerPoint. 12. How to transfer files to ipod, Pocket PC or Blackberry ? To start with, connect the ipod, Pocket Pc or Blackberry to a computer. Make sure there is enough memory space on these devices. Search for the video folder on these devices and then copy paste the converted files to this video folder. Try playing the video files on the device and check how it responds. 13. Is it possible to burn new disc without going through the conversion process again ? You can burn the earlier converted files to disc or convert the presentation to a new location and then burn the files to disc. 14. After conversion it is observed that some files or slides are interrupted for a while or skipped when playing the converted file in Window Media Player ? Before playing the converted files in Windows Media Player make sure you have the latest version of DVD codecs installed. 15. When playing the converted presentation on TV it does not display on full screen ? Make sure your TV screen settings are correct and in order. Try changing the screen mode of your TV to different levels ( Normal/Zoom/Wide/Full ). Check each settings and verify which module suits the best. 16. After conversion the file size is very large. Is it possible to reduce the file size ? The size of the converted file depends on the size of the presentation, the size of the Audio / Video file, size of the narration file inserted and the properties selected for the Audio / Video conversion. If the video bit rate, frame rate etc is selected as high, then the size of converted file will go up. You can set a lower bit rate for a smaller file size but the quality of the output file will be drastically reduced. 17. What's your Upgrade Policy ? If you are a registered user of PowerDVDPoint Pro Software, you are entitled to receive all future updates of this software totally free. 18. Does PowerDVDPoint Pro support conversion of loop presentations ? Yes, PowerDVDPoint Lite & Pro support looped presentations. But after conversion the loop function does not work. 19. Why is it that the audio in the original PowerPoint presentation is not converted ? Before converting a PowerPoint presentation that has an audio inserted, make sure that the audio source file is saved in the same folder as the PPT file. Then proceed with the conversion process. 20. Does the program retain all the original effects of my PPT file, like preset timings, animations, video and audio and all transitions after conversion ? Yes, PowerDVDPoint Pro is capable of retaining all the PowerPoint effects applied to the original PPT presentation after conversion. No effects are lost after conversion. 21. What is the difference between registered version and trial version of PowerDVDPoint Pro ? As of such there is no functional difference between the two versions. The only difference being the trial version will display a watermark on all the converted videos files. 22. What is the difference between PowerDVDPoint Pro and PowerDVDPoint Lite ? 23. After conversion, some of the presentation texts looks blurry and unclear ? Please try these resolutions and convert the presentation again... Open original presentation and increase the page size of the presentation, if shadow effects is applied to text - remove the shadow effects, make sure you are using contrast colors for texts and backgrounds, verify graphic objects and texts are not combined as it may reduce the text quality after conversion. 24. Does PowerDVDPoint Pro support latest version of OS and Office ? PowerDVDPoint Pro is compatible to work with the latest version of Windows 7 and PowerPoint 2010. 25. What is the minimum software requirement to run PowerDVDPoint Pro? 26. What is the minimum hardware requirement to run PowerDVDPoint Pro ? Make sure you have DVD software or codecs installed on your system and the codecs supports the dvd video format. 28. Sorry, I can't find my issue mentioned here ! ? Don't worry. Please write to us at support@digitalofficepro.com. Our support guys will contact you and get the issue resolved.